The Refined Geek » Warhammer 40000 Space Marine: Awesomely Epic Fun. Warhammer 40000 Space Marine: Awesomely Epic Fun. I’ll be honest, hack ‘n’ slash games aren’t really my forte. Sure I’ve played a couple in the past and enjoyed them (like Infinity Blade) but I was never able to get into the big titles like God of War, Bayonetta or Darksiders. I think it comes down to the (usually) rather thin plots and lack of hooks early on in the game that fail to grab my attention, making them rather easy to put down. Still on recommendations from my friends and family I purchased a copy of Warhammer 40K: Space Marine and was pleasantly surprised by how gripping this hack ‘n’ slash game was. 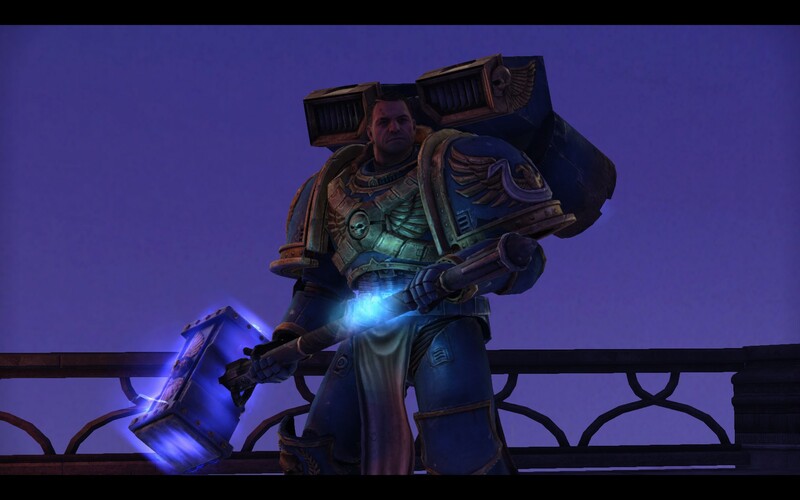 You play as Captain Titus of the Ultramarines, an elite super-human soldier who serves the Imperium of Man. 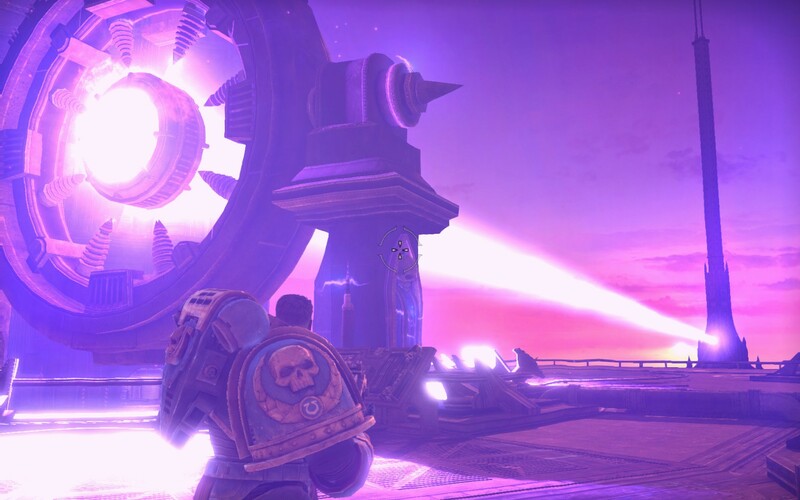 One of the Imperium’s forge worlds, a planet dedicated solely to the manufacturing of the Imperium’s armaments, has come under attack from an Ork invasion. Titus is then sent to the planet in order to delay the invasion for as long as possible in order for an Imperium fleet to arrive. Of course the Ork invasion isn’t the only thing out of the ordinary on this forge world as Titus finds out as the game progresses. Space Marine does an excellent job of incorporating the vast lore that exists within the Warhammer 40K world. Way back when I was a big fan of nearly all of the Games Workshop games and I’m sure I’ve still got one of the boxed 40K sets sitting up in my parent’s attic somewhere. Right from the start you get the feeling that this particular story is just a sliver of the giant universe in which it is set. Thankfully most of the details of the story aren’t hidden text dumps scattered around the place, with most of the important details being revealed in dialogue exchanges between the characters. Relic has also done a fantastic job with the set pieces that you’ll come across during you’re adventures in Space Marine. 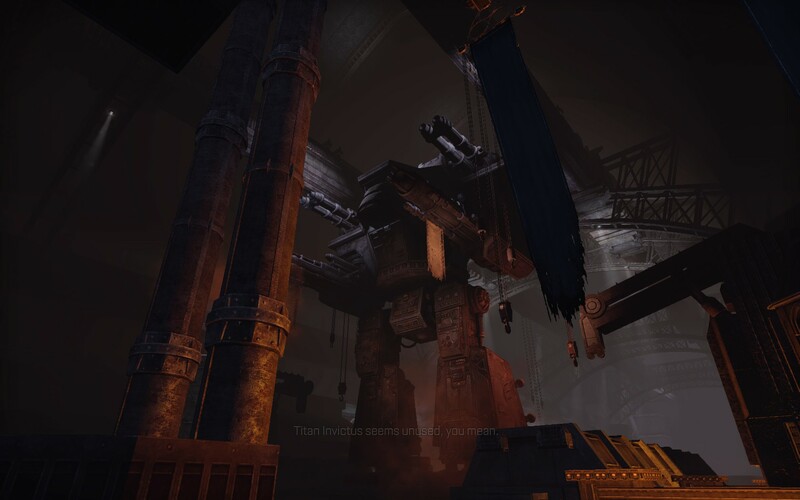 All of the environments have a sense of epicness about them, from the wide open spaces that are filled with countless enemies to the underground tunnels that seem to go on for forever. Yet again this reinforces the larger than life feeling that this game seems to convey, constantly reminding you that you’re but a small cog in the giant wheel of the Imperium of Man. The graphics as well, whilst nothing spectacular, work quite well within the context. I was never good at painting my collector of miniatures but I always loved seeing the ones which people had done right. Space Marine then evokes that same feeling as they’re extremely well done in true Warhammer styles. This extends to all the additional things like the foley, camera work and use of slow motion to really round out that epic movie feeling. Overall the look and feel of Space Marine is just exquisite, but that would be for nothing if the game wasn’t fun to play. Combat in Space Marine is meaty, fast paced and just plain fun. There are 2 distinct modes of combat that you’ll use extensively throughout the game. The first is standard 3rd person shooter style which is your standard cover based affair. I’ll be honest and say that this was probably my least favourite aspect of the game as the shooter sections always felt like a distraction from true base of a hack ‘n’ slash game: the melee combat. Still there’s a variety of weapons to choose from (usually placed in piles in front of you) and your choice will determine how easy or hard a particular section is so there’s a definite bit of strategy in Space Marine that traditional hack ‘n’ slashers lack. 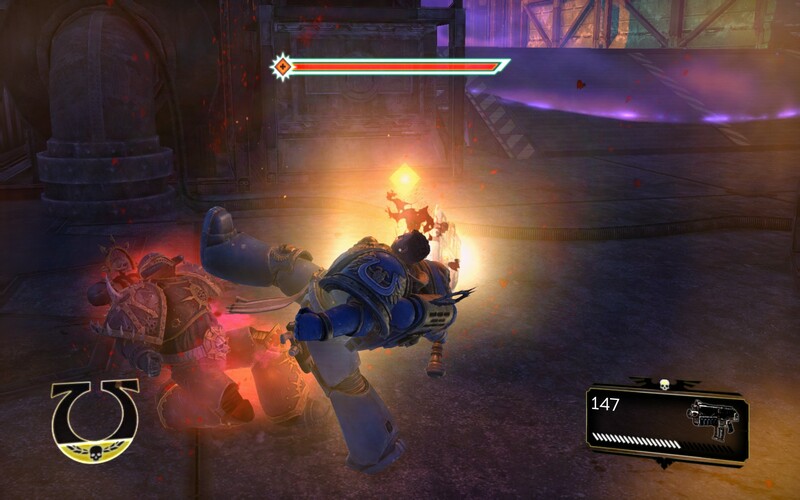 However the melee combat is really what makes Space Marine just so fun to play. Initially it’s somewhat of a chore as you’re just set up with a tiny combat knife but you’re quickly paired up with the iconic Space Marine weapon: the Chainsword. After that point it’s just simply glorius as you carve your way through untold hordes of enemies. They also change it up a bit when they introduce two other weapons (the Power Axe and Thunder Hammer) which breaks up the monotony considerably. The fury bar also makes for some interesting moments as once this bar is full you can unleash it, increasing your damage considerably and enabling you to regenerate health as you fight. Of course this is all taken to a whole new level when you’re given a jet pack which allows you to rocket skyward and then charge back down to earth, devastating anyone who’s in your landing zone. These sections always felt way too short but they are by far the most fun sections in an already amazingly fun game. There’s not much strategy to it but anyone can find the fun in rocketing around the place whilst laying waste to legions of foes. The multi-player in Space Marine is unfortunately a somewhat mixed affair. The core game play takes all the things you encountered in the single player and mixes them up into the now familiar persistent levelling multi-player experience. You start off with a few basic classes, weapons and perks available to you and as you level more of them are unlocked. The weapons, unlike other similar systems in say Call of Duty: Black Ops, can be somewhat game breaking in certain combinations. This is alleviated by the fact that you can copy an enemies load out when they kill you (for 1 life only) but the balance seems to kick in around the level 10~20 mark, which might be off putting to some players. The most unfortunate part about the multi-player in Space Marine is the lack of dedicated servers for hosting. This means that you have no choice of who you’re paired up with and all it takes is one player on the other side of the world to start making the game laggy. On the first game that I played it was completely unplayable with me and my fellow LANers being matched to people that were no where near us at all. Changing this up to just us (plus a few other locals) alleviated the lag completely, but getting this in a public game seems to be nigh on impossible. I played some more multi-player last night just to see if the issues were still occurring and whilst it was no where near as bad as it originally was there was still several occasions when it would starting lagging considerably or delay the game for 10 seconds whilst it waited for the current host to catch up. Talking this over with one of my mates who was a long time player of Dawn of War (another Warhammer based Relic game) this should have come as no surprise as they’ve had a history of atrocious netcode in nearly all of their games. Honestly when all the big names gave up quickly on the idea of serverless multi-player after one iteration you have to wonder why Relic went down this path as it basically ruins what could be an extremely fun and captivating multi-player experience. The game itself though stands well enough alone though that a bad multi-player experience really can’t detract from the sheer enjoyment I had during my time with Warhammer 40000: Space Marine. The settings are amazing, the lore deep and thoroughly engrossing and the characters believable and aptly voice acted. 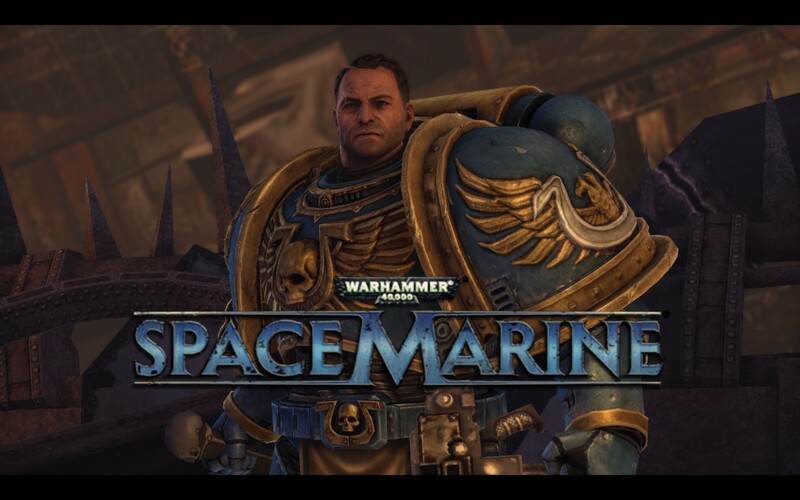 Space Marine hits all the right buttons and there was never a time when I found myself wanting to put the game down out of frustration, instead feeling myself improve gradually as I mastered all aspects that the game presented to me. For fans of the Warhammer lore I’m sure they’ll enjoy this faithful experience and for regular gamers there’s enough action and thrills to keep you interested right up until the final crescendo. Warhammer 40000: Space Marine is available on PC, Xbox360 and PlayStation 3 right now for $88, $108 and $108 respectively. Game was played on the hardest difficulty with around 8 hours in the single player and 3 hours in multiplayer. Pingback: The Refined Geek » Space Hulk: Deathwing: We Are The Emperor’s Blade.